Sherrie Rhodes grew up in Bossier City, Louisiana. She lived there until the age of 19, when she left Louisiana to attend college in Crown Point, Indiana. She received a Bachelor’s of Science degree in Elementary Education, and upon graduation in May of 1990 moved to Dwight to teach at the Dwight Baptist Academy. It was while teaching in the school and attending the First Baptist Church of Dwight that she met her husband, Bill Rhodes. They were married in November of 1992 and have two daughters, Allison and Katie. 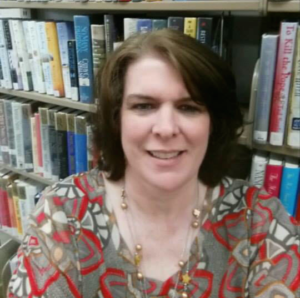 Sherrie began working at the Prairie Creek Public Library in December of 2005 as a part time library clerk. In 2010, she became the Summer Reading Coordinator and fulfilled this role until she became the Library Director in September of 2014.